You might think that one of the best ways you can make your money go a little farther each month is to keep an eye out for sales at your local stores to save money while getting the items you need. And it is true that some sales can be a great opportunity to save money under the right circumstances. However, many sales are just a marketing ploy by the retailer and end up costing you more money in the end. Before you pull out your wallet and buy up half of the items off the sale rack, consider some of the following reasons as to why you should avoid sales. This is the most common mistake people make when dealing with sales. Just because you find something on sale for a better price than is normally offered, doesn’t mean that you need it. In fact, unless you were already looking for this item and had it planned into your budget, you should probably steer clear of it altogether. The best way to stick to a budget is to avoid impulse purchases and sales are the ultimate way to test your discipline. Unless you already had planned the particular purchase then run the other direction. Let’s say you are looking for a certain item and you happen to find it on sale – should you make the purchase immediately? Not necessarily. You still want to do research into the product to make sure it is a brand with a good reputation for quality and customer support. Just because an item is cheap doesn’t mean it is the smart purchase. Always take some time to do your homework and confirm that the item on sale is made by a quality company and can be expected to live up to what you need it to do. Sometimes, sale items come with restrictions on returns and exchanges after you make a purchase. Check to see if that is the case with any items that you are thinking of buying from a sale at your local store. Often, saving the few dollars that the sale is offering isn’t worth the risk of not being able to return or exchange the item if it doesn’t work out for you. Buyer protection is important when purchasing consumer goods, so don’t give it up easily for only modest savings. This is especially the case if you’re not using a credit card that offers some sort of return protection. There is nothing wrong with using sales to get a good price on certain goods under the right circumstances. However, it is important to understand that some sales are simply not as good of a deal as they might seem at first. Make sure that you really need the item that you are purchasing, and that you are getting a quality item at a great price. Only when you check off the three points above and still feel like it is a good deal should you consider taking advantage of the sale. What do you do to avoid sales? What methods do you use to make sure a purchase is something you really should get? How much clutter do you have thanks to shopping sales? I’ve been finding more and more lower quality goods. Just recently I was out shopping and need a couple of t-shirts for working out. I tend to buy a couple for the sole purpose of working out/doing housework in. In other words, nothing fancy. I usually wait until I see some on sale for $12 and buy a few. This weekend I saw a sale for $10. I got excited but when I picked up the shirt, it was as light as tissue paper! There was nothing to it! No wonder is was $10. Heck they probably were still making a $9 profit on it, it was so thin. I’ve seen the same thing as well Jon. Makes me wonder what they’re made out of. Normally we only buy staples on sale. Things like penut butter, diced tomato, beans, veggies, frozen blueberries and strawberries etc. These items last a long time and we go through them quite quickly. Otherwise we typically stay away of sales for many of the reasons you mentioned. Sounds like a good plan Thomas. I now try to keep sale items to only things that I need. I used to buy a whole lot of things just because they were on sale and it got me into financial trouble and I also had a bunch of stuff in my house that I just didn’t need. We tend to be the same way. It doesn’t make any sense to buy it if you really don’t need it. I stay clear away from low quality for its a waste of money and time. Whenever I hit the sale rack I always keep in mind that what I pick is mine for good, so I have to love it. This is not easy for the items on the sale rack are there because no one wanted it, which is something to think about in some cases. They definitely can be a waste of both money & time. 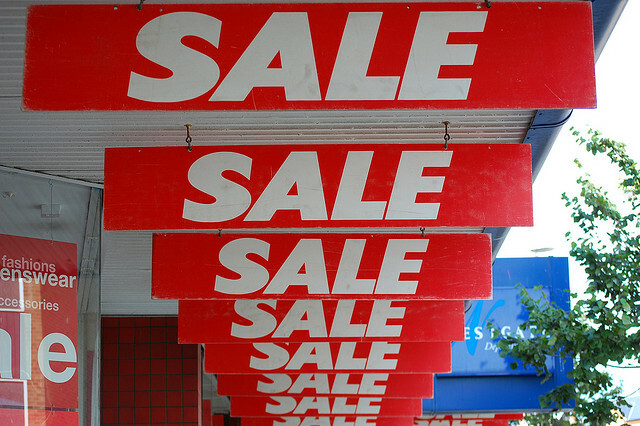 Avoiding the sales trap can be a hard one, especially if it looks like a solid deal. I have the same problem with Groupon and Living Social deals, some things I want to buy immediately but if I leave it for a bit once, I realize I would probably never use it. Another thing I do is avoid going to malls unless there is something I need there. I think shopping centres are an easy place to end up at if you’re bored so I try to have other things to do. If I’m not surrounded by a hundred stores, the chances of me spending money goes down a lot. Good article, thanks for the tips! Groupon & LS can definitely be a trap, I just tend to delete them. That’s one reason I avoid. Those sale items are sometimes in low quality and have no new stocks or limited sizes. I used to buy sale items even though it wasn’t my size and it was the display, because that’s the only piece left. Later on, I would find out that it had defects and regret buying it.